If you are still stockpiling rolled labels, name labels and year labels, or if your are ordering folders with pre-applied labels, then NetLabels can help improve your filing system while saving you time and money. NetLabels enables you to print color-coding, text and bar codes all on one easy-to-apply label, right from your own computer and any color printer. Don't change the way your files are labeled - change the way you label your files! NetLabels makes labeling easy and enables you to get your folders labeled exactly the way you want. NetLabels eliminates the need to bulk order pre-labeled folders or stockpile individual labels on rolls or sheets, because when you need to make-up folder(s), you can quickly and easily print the label(s) you need, with all the information for each folder on a single label. Its quick, easy and efficient. Its the 21st century way of doing business. NetLabels can be accessed from the Internet on an as-needed basis, or NetLabels can be installed on your own computer, network or intranet. NetLabels saves time and money by streamlining file labeling. With NetLabels, you can match the colors of your existing color-coded system and the arrangement of the labels on the folders. 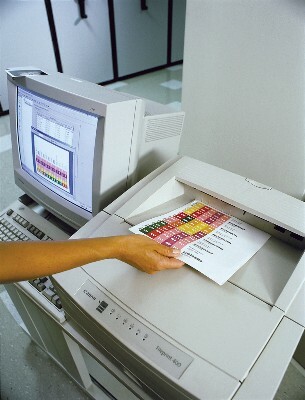 You simply print out a label from your own computer using any color ink jet or laser jet printer. Our easy-to-apply label applicator ensures that the label goes on your folders easily and quickly...in the right place every time. With NetLabels, you have the option of typing in information, using a spreadsheet, or opening data files saved from your own computer system to print one or multiple labels accurately and with ease. With NetLabels you match your existing filing system colors and label alignment.